Even though I had entertained the notion of getting a figure of this character almost since the premiere of the Clone Wars movie, truth is the articulation and the sculpture of the face always sent me back reeling to make other purchases. Even when they releases the version of Ahsoka in a space suit, I felt that the face was not sculpted particularly well, even considering the fairly stylized look of her in the series. Luckily, Hasbro then came up with this; the most recent (and probably final) version of the character, and it is all I had expected it to be. 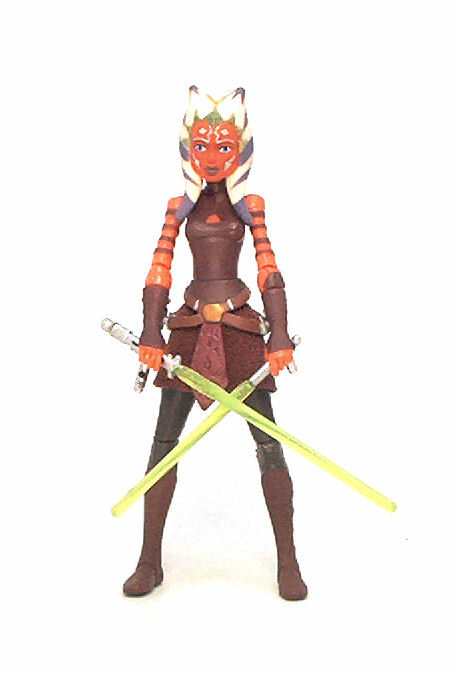 The face, for the first time, actually resembles the digital model used for the animation, and the rest of the figure does a pretty decent job of reproducing Ahsoka’s new attire. 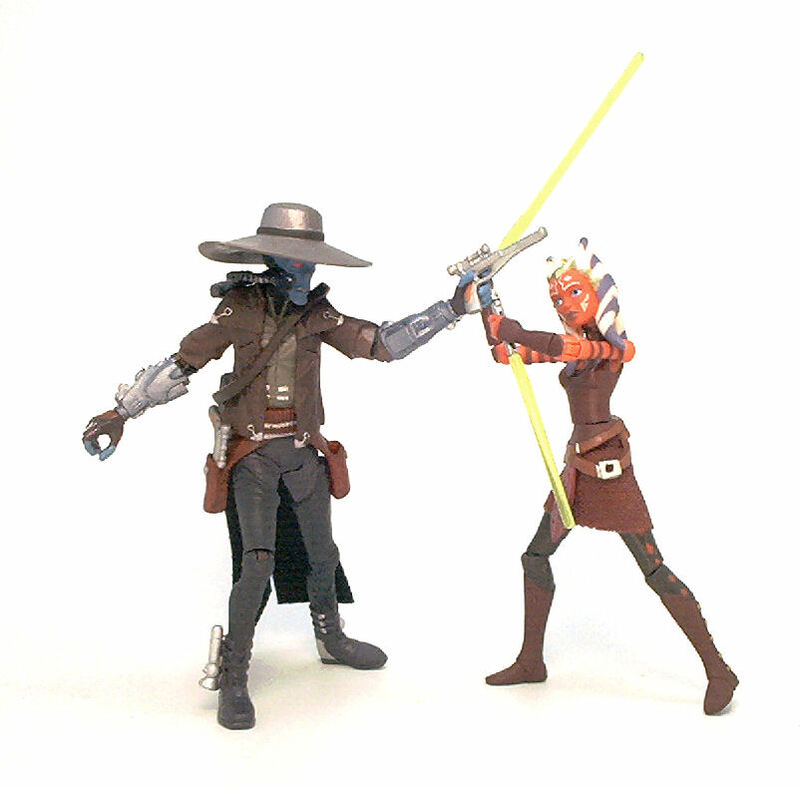 So yes, she lacks ankle joints, an articulation point that Hasbro seems to be leaving out consistently in these newer Clone Wars figures, but not a deal breaker in my book, especially taking into account how well the rest of the joints work. 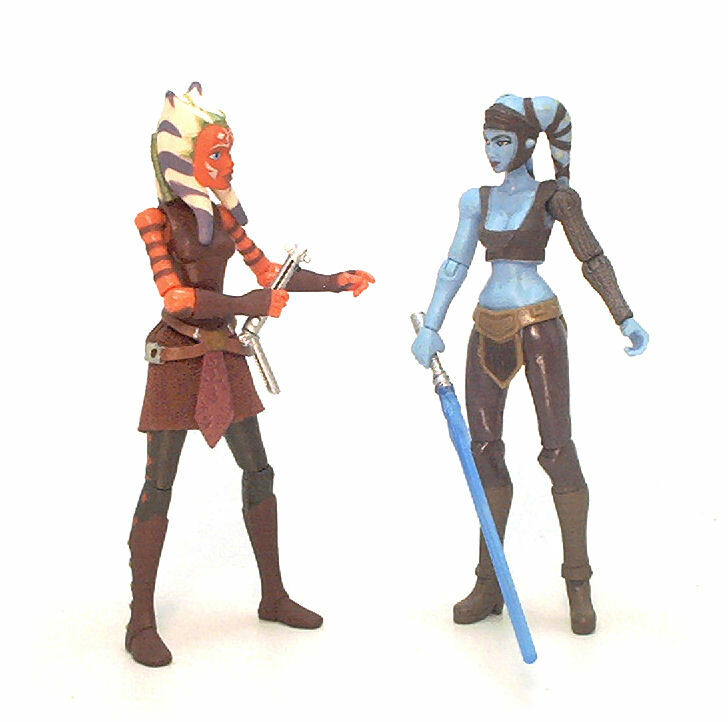 T he paint applications on Ahsoka are very clean and really bring out the best in the figure. The face paint is particularly good, giving Ahsoka big, bright blue eyes and her distinctive facial markings. Ahsoka has a short fabric skirt that allows an unrestricted range of motion on the hip joints, allowing for a fairly decent number of posing options. 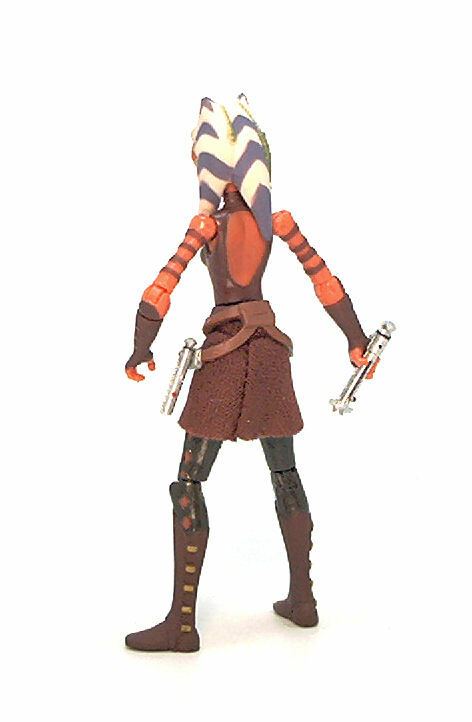 Ahsoka also wears a pair of rubber belts belts with peg-holes at each side to carry her two lightsaber hilts. 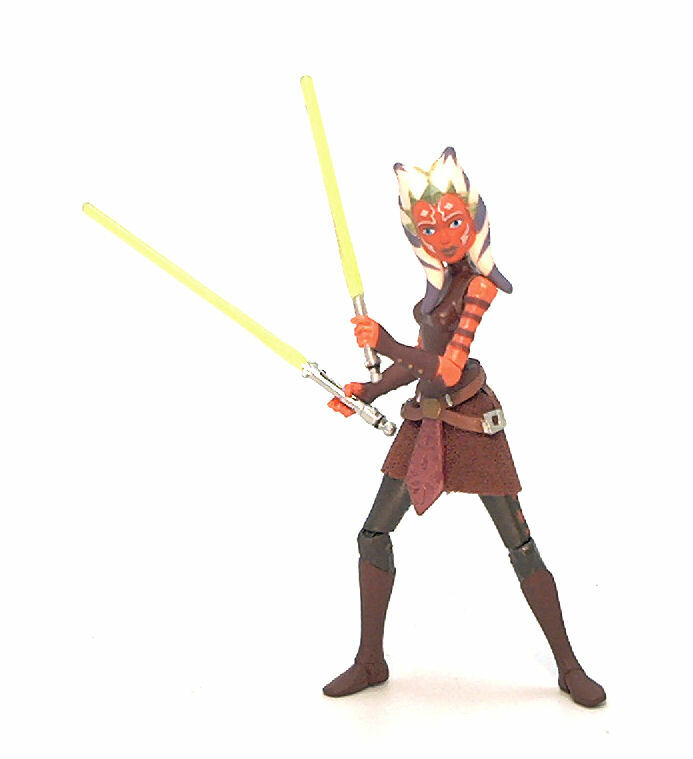 Also provided are the ignited versions of her lightsabers, both of different length and each molded with a green blade. 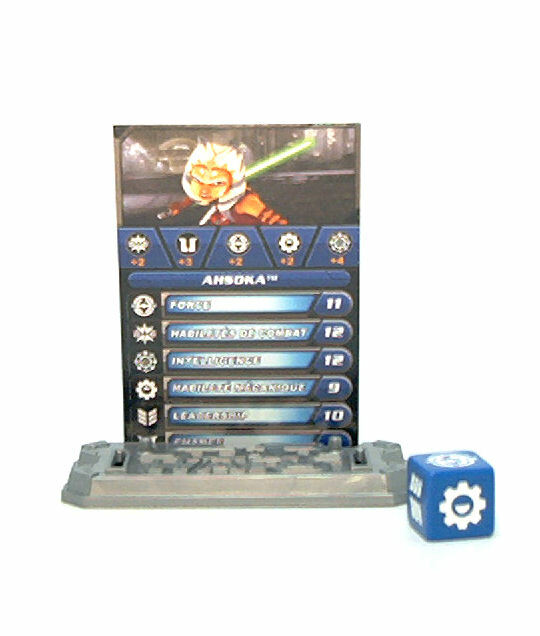 As usual in this line, the package includes a display base, a blue die and the corresponding game stats card for Ahsoka. This version of Ahsoka was one that I was already convinced never to find in the wild, but lucky me, local Wal-Mart received a “fresh” shipment of figures and I happened to be in the right one at the right time, getting the figure at 50% Off the MSRP for the line. Even without the discount, I must say that this is a figure that I was genuinely happy to add to my collection, because it is well constructed, it looks good and it represents a character that surprisingly has grow on me from watching the Clone Wars show, despite her bumpy start on the Star Wars universe.